Contributed by Laura Farrell / Through Christopher Manning’s current solo show “Everything as Perfect as it Seems,” the Fine Arts Gallery at Westchester Community College comes alive. The show wisely centers the manipulated Polaroids for which Manning is best known, and some 200 of these images line the gallery walls. Also featured are framed images in assorted media and three chrysalis-like chandelier installations. Together, the pieces demand consideration of essential dichotomies (memory/forgetfulness, truth/lies, light/dark, internal/external), while simultaneously holding space for subterfuge. Here there may be deception, distortion, hidden messages, and semiotically-unsound clues. Christopher Manning, It’s the only thing keeping, you, 2013, mixed media, 64 x 36 x 36 inches. 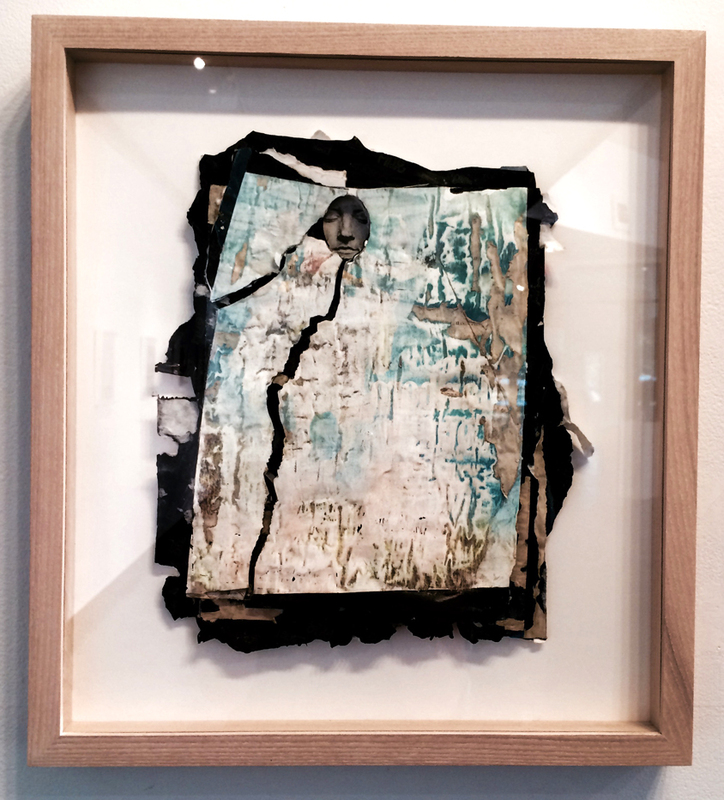 Each piece of Manning’s pieces utilizes a different process of exposition, manipulation, and fragmentation. Some incorporate sewn threads over sections of an image; others include cut film. A few include acrylic paint, ink, handwritten text, or collages of type. The fine details etched into his work open new doors of perception for the viewer, who feels compelled to explore her surroundings anew, re-assessing what is visible and what is hidden. A mound of materials, including headphones and string, fall downward to a narrow bottom in two of Manning’s chandeliers. A third displays a series of layers built upon each other creating one piece molded together. Whether through layers, obscurations, or distorted images, Manning’s work presents an opportunity to uncover what is hidden and, perhaps, what is true. 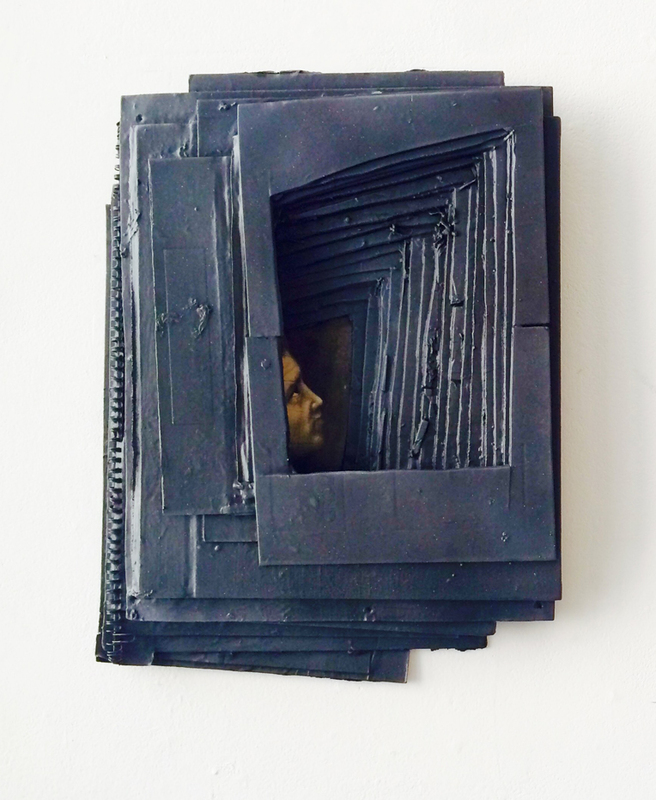 Christopher Manning, Kintsugi, 2014, mixed media. 14 x 17 inches. Christopher Manning, Glittering, Always Foolishly (II), 2015, mixed media, 48 X 29 x 29 inches. “Christopher Manning: Everything as Perfect as It Seems,” curated by Matt Ferranto. Fine Arts Gallery at Westchester Community College, Valhalla, NY. Through November 27, 2016.